Are you not sure how to use essential oils or what you should actually use them for? Well, this guide is for you then. I was just like that in the beginning when I didn’t know anything about essential oils. I stayed away from them for a long time, just because I didn’t know what to do with them and what they are good for. With time I learnt that essential oils are simply amazing – they have so many different uses and benefits. I came to a conclusion that everyone should have at least a few at home, especially because they are amazing natural remedies. So far I’ve only tried a small selection of essential oils and my favourites are tea tree essential oil and lavender essential oil. I use these pretty much every day. Recently, I’ve been testing organic essential oils from Sacred Soul Holistics so I also got to try a few new essential oils for me: peppermint essential oil and eucalyptus essential oil. Before we dive deeper into the benefits of essential oils, how to use them and what you can use them for, let’s clarify first what essential oils are. Essential oils are highly concentrated natural oils made from different parts of plants. Essential oils are what gives plants their distinctive smells. They are extracted using various methods such as distillation (using water) and expression (expressed mechanically or cold pressed). An oil is “essential” in the sense that it contains the “essence of” the plant’s fragrance—the characteristic fragrance of the plant from which it is derived (1). I am slowly learning what each essential oil is good for and their health benefits. It’s amazing what essential oils can do for our health, well-being and beauty. Have a headache? There is an essential oil for that! Itchy skin? Yep, there is an essential oil for that as well! Feeling anxious and cannot sleep? We probably all know which essential oil is good for that, right? The point is, with essential oils and aromatherapy you can naturally treat minor health concerns, skin issues and you can even calm the restless mind. The benefits of using essential oils are endless. Before you start using essential oils you need to know that they are highly concentrated and most of them shouldn’t be applied directly to the skin as a skin sensitivity could occur. It’s advisable to dilute more potent oils and when trying an oil for the first time. Only like that you can avoid strong reactions, especially if you have sensitive skin. The recommended dilution ratio is typically one drop of essential oil to three drops of carrier oil (you can use almond, jojoba or olive oil as a carrier oil). You can, of course, use more of a carrier oil, it all depends on what the purpose of your application is. There are hundreds of essential oils and in this guide I only list some of the most popular ones and various ways of using them. Possibly the only essential oil that is safe to apply neat to large areas of the skin, lavender oil is a key first aid remedy for home use and when travelling (2). 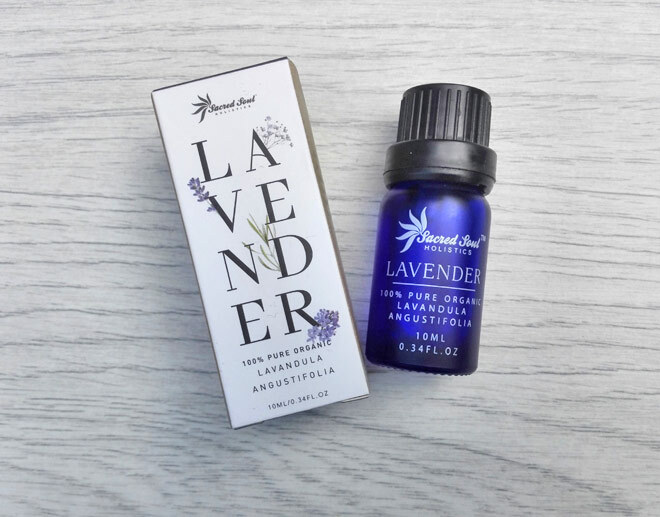 Lavender essential oil is one of the most commonly used essential oils and it’s well known for its calming qualities soothing nervous overactivity, stress-related headache, and migraine. It’s great for relaxation and anxiety and helps you sleep better. To learn more about lavender essential oil check out this page. Clinical research confirms the usefulness of peppermint essential oil in irritable bowel syndrome. The essential oil acts on the colon, relieving spasm and irritability, and reducing the sensitivity of nerve endings in the intestinal wall (2). 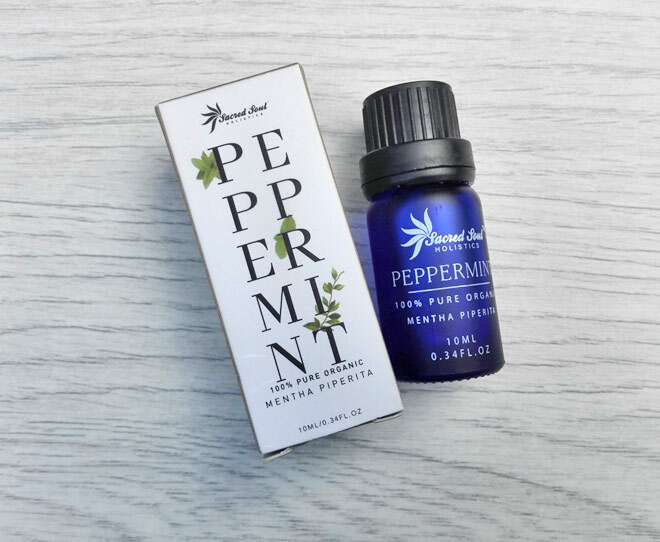 Peppermint essential oil is known to energise your body and mind while helping you ease aching muscles. As a natural air freshener, it creates an energising ambience and mood. Used together with elderflower it creates an effective combination for fever, colds, catarrh, and gastric infection. A key aboriginal remedy of Australia, eucalyptus can be used to treat everything from colds and chest infection to skin conditions and fever (2). 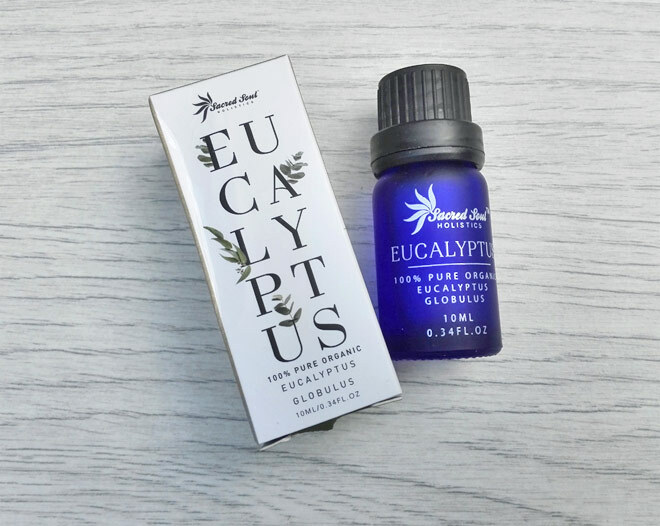 Main uses of eucalyptus essential oil include cold symptoms with or without feverishness, nasal and sinus congestion, sore throat, and phlegmy cough. It can also be used for skin problems such as insect bites and fungal skin conditions. A must have for any home herbal first aid kit, tea tree oil can help treat many minor fungal and bacterial skin problems. 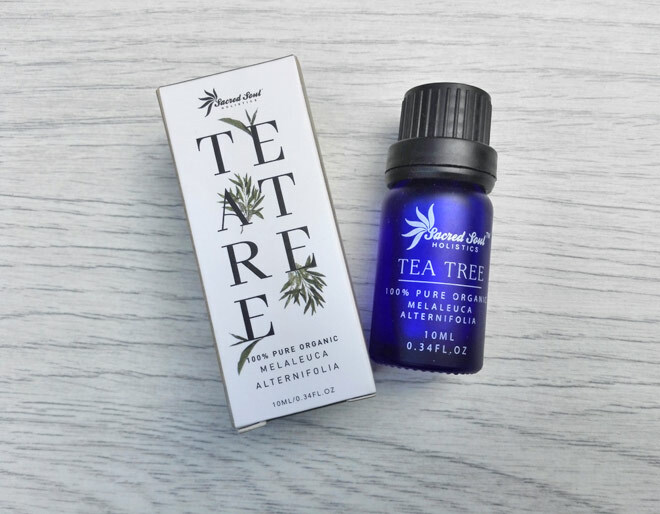 Tea tree essential oil has been widely used throughout Australia for at least the past 100 years. Several medical studies have shown its effectiveness in killing many strains of bacteria, viruses and fungi. Tea tree essential oil is the oil I personally use the most. I mainly use it to treat spots and acne but also to clean my home naturally. It’s a great disinfectant and successfully kills mould. It’s really effective on fungal skin infections too. The intensely sweet, enticing aroma of ylang ylang is said by many to have aphrodisiac properties. Ylang Ylang essential oil is not an essential oil which I use often, I am still learning what to do with it actually. I’ve used it for the massage but that’s about it. However, further research has shown that it’s much more useful than that. If you are going to buy yourself some essential oils, make sure you buy pure essential oils with nothing added to them. Even better if you can buy organic essential oils as these won’t contain any pesticide residue and tend to be of a higher quality. Don’t go for the cheapest oils as you don’t know what they put in them and how pure they are. Remember that lower quality essential oils could harm your skin while failing to provide the necessary therapeutic benefits. If you are looking to buy organic essential oils, one company to consider is Sacred Soul Holistics. They currently have five essential oils available to buy and I’ve been testing them all over the past few weeks (tea tree oil, lavender oil, Ylang Ylang, eucalyptus oil, peppermint oil). The price of organic essential oils is not so much different from non-organic oils, so well worth a buy. Although Sacred Soul Holistics is a British company, the essential oils they sell are organically certified by ACO which is an Australian-based certification body. The reason for this Australian organic certification is because the business co-founder emigrated to Australia where he sourced their first essential oil from (tea tree oil). What I really love about this company is that they are really open and honest about the purity of their essential oils – on their website you can actually find the results of the oil tests showing their 100% purity. 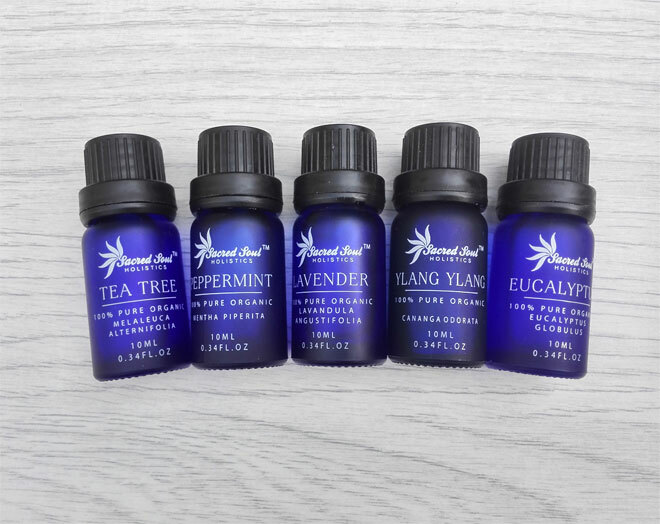 All the essential oils that I’ve tested from Sacred Soul Holistics have a really strong aroma and their scent is 100% natural, you can definitely smell their purity. So big thumbs up for that. 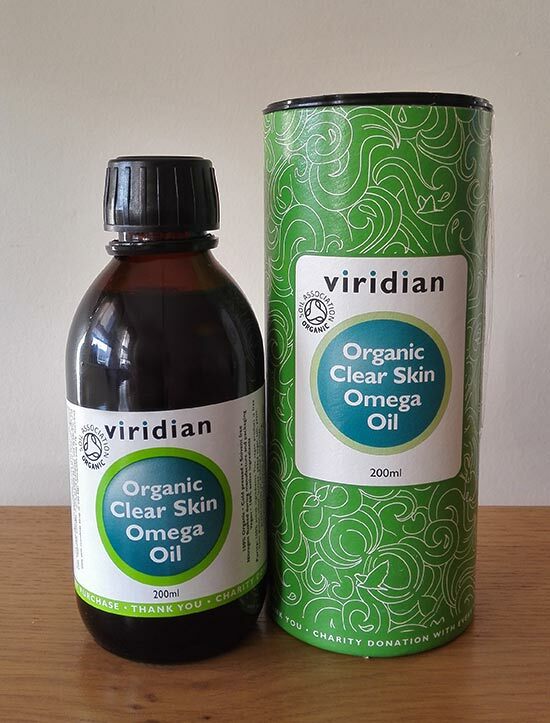 The oils come in glass bottles and I really like the little instructions leaflet inside the packaging – it briefly explains basics about each oil and some of their uses. I haven’t seen anything like this with the essential oils I bought in the past (I think most companies expect you to know basics about essential oils and how to use them, that’s why they don’t include it). All in all, I couldn’t find any faults in essential oils from Sacred Soul Holistics and I am happy to recommend the company to my readers. I hope this essential oils guide help you gain a little bit more understanding about essential oils, their benefits and how to use them. Have you tried any of the essential oils mentioned in this post? Do you use essential oils regularly? (2) Chevallier, A. (2007). Herbal Remedies. London: Dorling Kindersley Limited. Hi Karan, there is nothing that can replace essential oils as far as I know. Many of the essential oils are actually sourced from India but I wouldn’t know where to buy them from. This is a valuable resource. I didn’t know that many of these essential oils could be used for so many of these things. I am glad you are finding this article useful. It’s amazing how many uses the essential oils have, it’s well worth having them at home. Very informative post, Petra! I am a huge fan of essential oils. I use them to make my DIY cleaners, disinfectants, and air fresheners. Tea tree, lemon, lavender, and cinnamon oil are my favorite for making my natural cleaners.